Eight titles from Barbara Quinn, registered dietitian and certified diabetes educator, and the Academy of Nutrition and Dietetics’ Good Nutrition Reading List. Shopping for reliable nutrition and cooking books is a bit like picking out a good wine. It helps to know the source. Here are some picks from my own reviews as well as from this year’s Good Nutrition Reading List by the Academy of Nutrition and Dietetics (eatright.org). 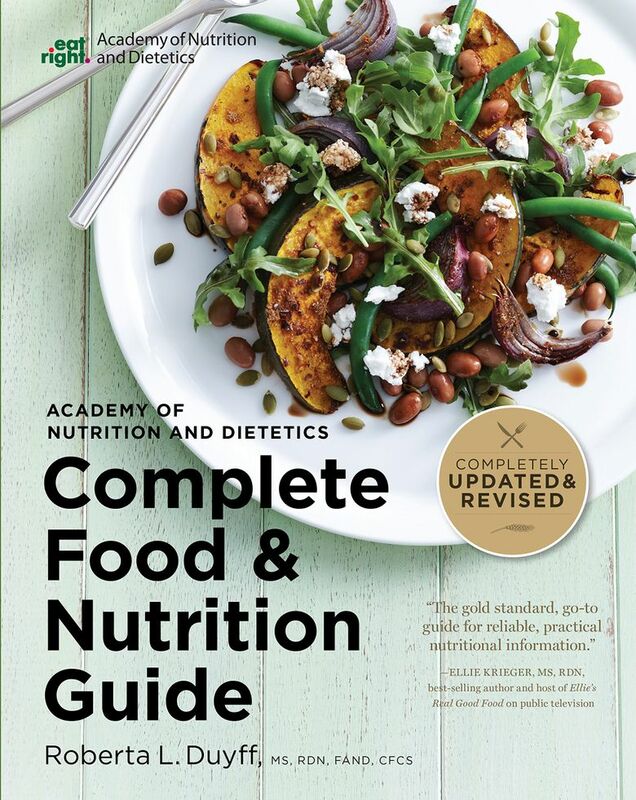 “Academy of Nutrition and Dietetics Complete Food and Nutrition Guide,” 5th edition, Roberta Larson Duyff, MS, RD, Houghton Mifflin Harcourt, 2017. This newly revised edition provides the latest research-based advice on optimal nutrition for every age and stage of life. “Expect the Best: Your Guide to Healthy Eating Before, During and After Pregnancy,” 2nd edition, Elizabeth M. Ward, MS, RD, Academy of Nutrition and Dietetics, 2017. Hot off the press, this edition offers current research recommendations for women at every point of the becoming-a-mommy timeline. “Quinn-Essential Nutrition: The Uncomplicated Science of Eating, Barbara Quinn,” MS, RDN, CDE, Westbow, 2015. Woo hoo! We made another year on the Academy’s Recommended Reading List. Similar to this column by yours truly, this book provides facts featuring family and friends on more than 100 nutrition topics. “Eat Like a Champion: Performance Nutrition for Your Young Athlete,” Jill Castle, MS, RDN, AMACOM, 2015. Great gift idea for parents and coaches, this book explains the unique nutrition and energy needs of active youngsters. Sound advice. “Nancy Clark’s Sports Nutrition Guidebook,” 5th Edition, Nancy Clark, MS, RD. Human Kinetics, 2014. For adult athletes, I consider this the gold standard guidebook for sports nutrition. And this sports dietitian practices what she preaches. “Diabetes Meal Planning Made Easy,” 5th Edition, Hope S. Warshaw, MMSC, RD, CDE, American Diabetes Association, 2016. Written by a certified diabetes educator, this book simplifies the process of planning meals for anyone with pre-diabetes or diabetes. Includes sections on restaurant eating as well. Well done. “The Modern Salad,” Elizabeth Howe, Ulysses Press, 2016. Creative home chefs will appreciate the subtitle of this book: “Innovative New American and International Recipes Inspired by Burma’s Iconic Tea Leaf Salad.” Read the first chapter of the book to find out what that means. What I like are the varied and balanced salads with plenty of choices for beef, pork, fish and vegetarian tastes. Barbara Quinn is a registered dietitian and certified diabetes educator affiliated with Community Hospital of the Monterey Peninsula. She is the author of “Quinn-Essential Nutrition” (Westbow Press, 2015). Email her at barbara@quinnessentialnutrition.com.